Adam Hamdy's debut novel, Pendulum, was touted as "one of the best thrillers of the year" by James Patterson. 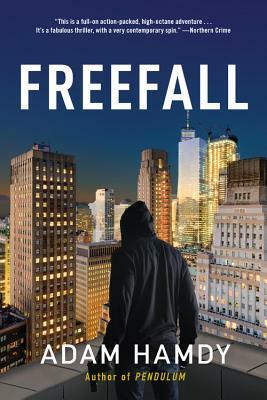 John Wallace returns in Freefall and must figure out who he can trust in this high-octane sequel. Eight months after confronting the Pendulum killer, John Wallace is losing himself in a dangerous warzone in a misguided attempt at penance for the deaths that he believes he caused. But an assassination attempt leads Wallace to realize that he has once again been targeted for death. This time, Wallace is prepared and, tracking down his would-be assassin, he discovers a link to his nemesis, Pendulum. That link is the missing piece of a puzzle that has tormented FBI agent Christine Ash ever since they confronted Pendulum, but with no Bureau support, she has been unable to pursue her case. Wallace's proof puts her back on the trail, but it also exposes them both to terrible danger. Confronted by a powerful, hidden enemy, Ash and Wallace must overcome impossible odds if they are to avert a dangerous challenge to the networked world that threatens to destroy our entire way of life. Adam Hamdy is an author, screenwriter, and filmmaker who has worked with producers and studios on both sides of the Atlantic. In addition to his own original work, Adam has adapted a number of comic books and novels for the screen, including the forthcoming film version of David Mitchell's novel, Number9Dream. Pendulum is Adam's third novel. Prior to becoming a writer, Adam was a strategy consultant and advised global businesses operating in a wide range of industries. Adam lives in Shropshire with his wife and three children. "Wallace returns to England and then sneaks into the U.S. to reconnect with the team that helped him take down Pendulum. FBI agent Christine Ash and London copper Patrick Bailey have become targets themselves, and it's rescue upon rescue upon rescue until they can square off against their new foe . . . A fast-paced, high-octane thriller." "I read Pendulum in one gloriously suspenseful weekend. Definitely one of the best thrillers of the year."